The director and licensee of a takeaway business in Portishead is facing costs of more than £3,000 for failing to supply information to Avon Fire & Rescue Service under the Regulatory Reform (Fire Safety) Order 2005. Mr Abdul Wahid, who runs the Kashmir Indian Tandoori Takeaway in the High Street, appeared before North Somerset Magistrates Court on Friday 16 August. He pleaded guilty to two charges of breaching Article 27 under the Regulatory Reform (Fire Safety) Order and was fined £3,103.16. The Regulatory Reform (Fire Safety) Order 2005 applies to all buildings, places and structures used as workplaces. It requires all business owners and managers to ensure a thorough fire safety risk assessment has been completed to protect staff, contractors and customers. 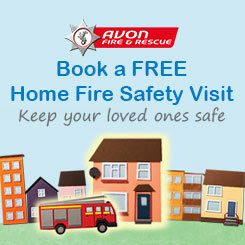 The order is enforced by Avon Fire & Rescue Service (AF&RS). Under Article 27 an inspector from AF&RS may do anything necessary for the purpose of carrying out the order, including making enquiries regarding the premises, compliance of the order and to identify the individual responsible for the premises. The North Somerset Council Food Safety Team alerted AF&RS to possible fire safety breaches at the premises and AF&RS made three attempts to contact Mr Wahid to discuss the issues without success. After receiving no contact from Mr Wahid, AF&RS took the decision to proceed with the matter through the courts. Head of Technical Fire Safety, Matt Peskett, said: “We welcome the outcome of this case. It sends a clear message to all business owners and managers that the fire safety order must not be ignored. Mr Wahid was fined £200 per offence, ordered to pay £2,683.16 in costs to AF&RS and received a victim surcharge of £20, resulting in total costs of £3,103.16. The court advised Mr Wahid that if he defaults on payment of the costs he could face three months in prison.